Black-eyed peas were a common part of my southern diet while I was growing up in Mississippi. As I’ve written about food over the last couple of years, I often get curious about foods that I know so well, and I always find it interesting to investigate their history. It’s easy to think foods that you’ve eaten your entire life have been around forever, but that’s not always the case. Black-eyed peas, known by their pale color and black spot where the pea attaches to the pod, probably originated in West Africa several thousand years ago. These legumes made their way to America on slave ships where they nourished the enslaved. A staple of the slaves’ diet, black-eyed peas eventually made it to their masters’ tables and became a regular part of Southern meals. They became indelibly linked with African Americans and the American South. Southerners love their black-eyed peas on New Year’s Day. A typical meal in my house on this holiday includes black-eyed, collard greens, and cornbread. Black-eyed peas bring good luck and collards assure prosperity. I’ve said in previous posts this month that I’m incorporating more beans in our diet in place of meat. I’ve been exploring variations on different beans, so I wanted to try something different with black-eyed peas. I’d never had a black-eyed pea soup so I thought I’d try my hand at one. Enhanced with chicken sausage, this slightly smokey and spicy soup is the perfect hearty soup for a cold January night. 1. Heat olive oil in a Dutch oven or soup pot over medium high heat. Transfer onion, red pepper, and garlic to pot and saute for 3 to 4 minutes until onions are translucent. Add sausage and continue cooking for 3 to 4 minutes until sausage is browning. 2. Add chicken stock, oregano, cumin, chipotle seasoning, salt, pepper, and black-eyed peas. Bring to a boil, reduce heat, cover and simmer for 30 minutes until peas are tender. 3. Transfer 3 cups of soup (remove any sausage pieces) to a blender or food processor. Process until smooth and return to pot. Stir to combine. 4. Ladle soup into bowls and garnish with a dollop of sour cream and parsley. 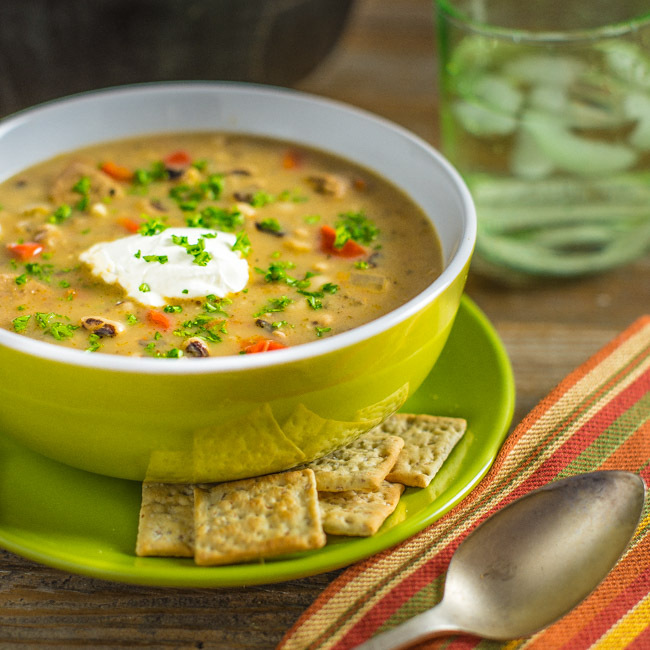 Always looking for new ways to enjoy black-eyed peas and this is a great one! It feels like winter is never going to end over here so your soup is going to be a great way to warm me up. Thanks Bill! I love black-eyed peas and every New Year’s day I make Hopping John soup, so I know I’d love this one too. I love black-eyed peas! And make a Hoppin’ John Soup that’s somewhat similar to this. Love the idea of chicken sausage, though — much healthier than ham, and mighty tasty. Good stuff — thanks.